These destructive ants are prevalent across the entire southern tier of the United States, from North Carolina, southern Tennessee, and southern Arkansas west to central Texas, with pockets of infestation in Oklahoma, western Texas, New Mexico, and southern California as of 2015. And they have the potential to spread more widely, especially in mild winter areas of the Southwest and West Coast. These pests make conical nests as large as 18 inches in diameter and 10 inches high. If disturbed they attack aggressively, stinging the intruder. They also feed on germinating seeds, young shoots, fruits, and saplings. Like other ants, fire ants nurse aphids on plants, protecting the pests from predators in order to obtain their sweet excrement (honeydew). 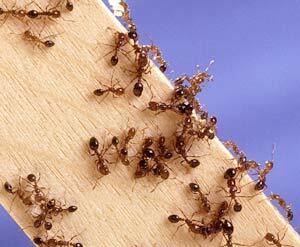 Adult fire ants are reddish to dark brown. Winged reproductive forms appear in the spring and early summer. After mating the male dies and the female establishes a new colony. Her first eggs hatch in a week, and the resulting worker ants mature in less than a month. A queen can live several years, producing more than 1,500 eggs per day. Natural enemies of fire ants have been tested for mass releases that would control the ants in large areas, and progress is being made. Biological control agents include Beauvaria basisanna, a natural fungus disease that attacks fire ants, and beneficial nematodes. Pouring boiling water on individual mounds is effective in small areas.